REWARD FOR EFFORT (AUS) (Bay 2006-Stud 2011). 4 wins-2 at 2, MRC Blue Diamond S., Gr.1. Sire of 157 rnrs, 72 wnrs, inc. SW Gold Symphony (MRC Vain S., Gr.3), Brugal Reward, Take Pride, Dalradian, SP Gratwick, Tuff Bickie and of Hell of an Effort, Jevilla, Montana Star - Star Superior (H.K. 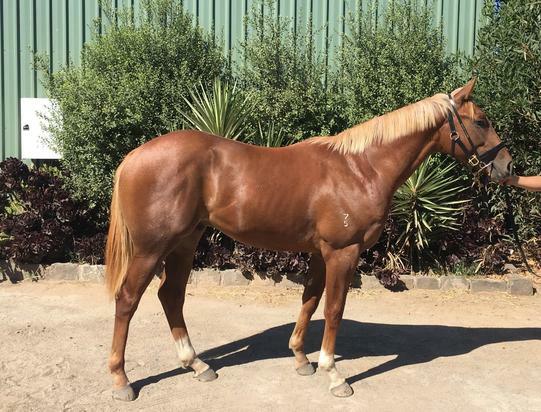 ), Petite's Reward, Blondie, Airlie Reward, Amaliemoo, Bounce Down, Desert Lashes, Premium Reward, Siren's Reward, Vikings Reward, Big Effort, Greensborough, etc. Raijinz (g. by Snippetson). 6 wins to 1350m, A$170,885, to 2016-17, ATC Tooheys New Evening Star H., 2d ATC Tab.com.au H., 3d ATC TAB Early Quaddie P.
Miss Charisma (f. by Denman). 2 wins at 1050m in 2015-16 in Aust. Shaq (g. by Savabeel). Winner at 1600m in 2016-17 in Aust. Firebird (f. by Southern Image). Placed at 3 in Aust. Black Mink. Winner at 2 in 2016-17 in Aust. Jack's Girl. 7 wins. See above. Speedy. 4 wins at 1400m, HK$2,418,200, HKJC Horseshoe Grill H., Kreta Ayer H., Swan H., Pollock H., 2d HKJC Red Packet H., Lei Yue Mun H., Wong Leng H., Tai Chung Kiu H., Ho Chung H., 3d HKJC Grampian H., HKU Architecture Alumni H., Midland Living Up H.
Choir Girl. Winner at 1400m in Aust. Zedace. Winner at 2000m in 2015-16 in NZ. Zakaluka. 3 wins at 800m, 1000m in Aust. Dentente. 2 wins at 750m, 1100m in Aust. Fun Gold. Winner at 850m in Aust. Koryo Star. 10 wins-1 at 2-to 1400m, AJC Fairy Walk H., Mersey H., Seabreeze S., STC Museum H., Jeldi Carpets H., Farnworth Welter H.
DANCEFLOOR DOLL (Voodoo Rhythm). 3 wins-1 at 2-from 1200m to 1600m, A$106,100, MVRC Crown Lager S., L, 3d VRC Wakeful S., Gr.2. Producer. ADMIRAL (Align). 4 wins from 1000m to 1600m, NZ$93,475, to 2016-17, Counties RC Karaka Classic, L, ARC Rotary H.
MAKE A SCENE (Scenic). 8 wins-1 at 2-from 1200m to 2200m, A$321,070, SAJC HIH Insurance Classic H., L, 2d VATC Coongy H., Gr.3. EXCITING JOE - EXCITING REVIEW (Mal.) (Ring Joe). 6 wins from 1200m to 1600m in Aust. and Malaysia, Perak TC Coronation Cup, L, 3d Singapore TC Lion City Cup, L.